Is the conservator of the cultural diversity on our planet. Their cultural heritage comprises many languages and individual and independent forms of living, the roots of which still being accessible by us, as well as their experience of life and their everyday routines, their religion and their inter-action with nature. They are called indigenous population as they have been living in a certain territory they had settled and utilized first. Where they have been living, there is still existent a rich and diverse fauna and flora. We have, however, no idea how long this will be conserved for our descendants, as there is searched for raw materials and not always extracted in an "environmentally-friendly" way in their habitats. The group of the indigenous people comprises the Adivasi in India, followed by the indigenous peoples of the American continent, the Tuareg in the Sahara, the pygmies or bushmen in the Central-African rain forest, the San peoples in the south of Africa, the Penan in Malaysia, the mountain peoples in Bangladesh and Burma, the Ainu in Japan, the Maori in New Zealand, the Aborigines in Australia, the inhabitants of the Pacific Islands, the Inuit in Alaska, Canada and Greenland, the Sami (Zyrian people) in Scandinavia and on the Russian Kola peninsula, or the small peoples of the High North and the Far East in Siberia. 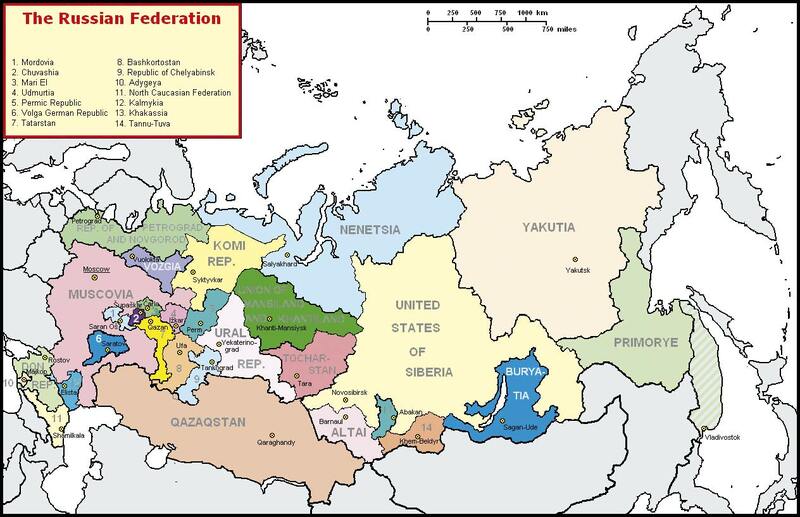 Siberia is considered the true treasure within the Russian Federation (see map). Apart from oil and gas, there are here further extracted gold, diamonds, silver, copper and other raw materials. This area is the home of an indigenous population comprising various tribes under arctic and sub-arctic conditions and being associated with various language families. In spite of history and language related differences, there is existent a multitude of cultural common grounds, the fundamental features of which being based on geographical and climatic conditions. In this way, as nomads (breeding sheep, cattle, horses and, in the High North, especially reindeers), they all share a form of living as hunters, gatherers or fishermen. In the south, there is situated a vegetation zone having a huge coniferous forest belt of the Taiga. These forests alternate, especially in western Siberia, with extended swamp areas, while the East is dominated by areas with high mountains. Up to the 17th century, Siberia was more or less undiscovered, this vast land beyond the Ural, reaching as far as the Sea of Okhotsk; this is a huge landscape, the expansion of which is limited, starting from the Ural, in the Far East by the Pacific Ocean, in the High North by the Polar Sea, and in the South by the Kazakh Uplands. In spite of various conquests, however, their original cultures have been fundamentally conserved. 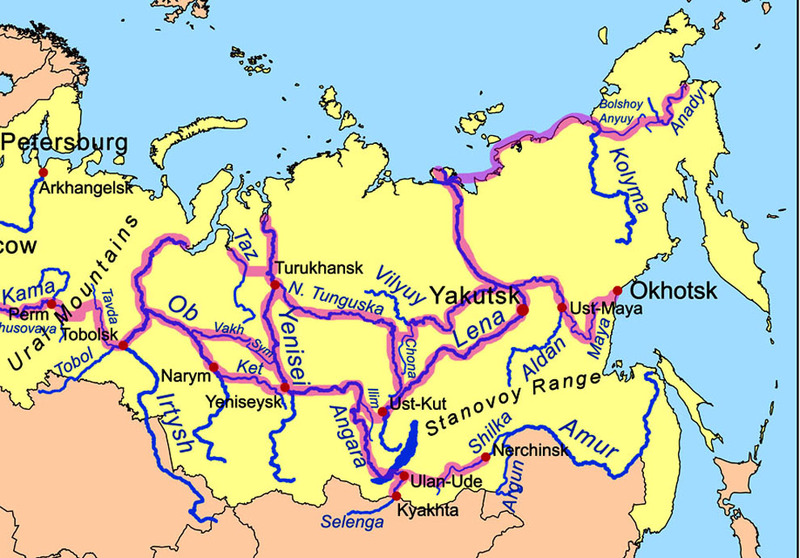 Some of the largest rivers of the world are crossing Siberia towards the Arctic Ocean: Ob River, Yenisei, Lena River and Kolyma River (see map). These have ever been main routes of traffic, during the period of colonization as well as during the exploitation of rich resources, which was to follow and has continued until now. From the peninsula Kola in the west as far as the Chukchi Peninsula in the East, a vast, extensive but rather thinly populated zone is extending along the Arctic Ocean. These areas are mainly situated in the north of the permafrost line of the Siberian north, which reach far into the south in the East-Siberian Highlands. This 55° northern latitude corresponds with the geographical latitude of Schleswig-Holstein (Germany). At the shores of the Pacific Ocean, the Sichote-Alin Mountains (1) are also included; this is where the drift ice line is situated in the south at the Russian-Chinese frontier near Vladivostok. 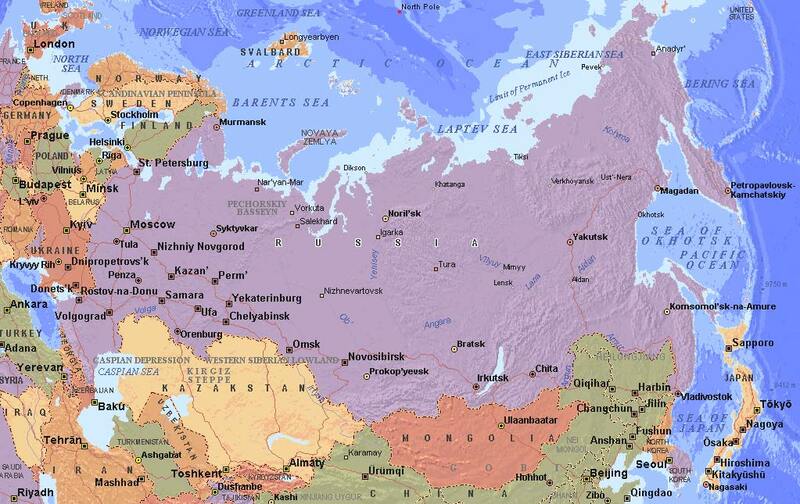 This indigenous population (or indigenous peoples), who had owned this huge territory before colonization, is called "peoples of the North" in Russia. The lands in the north are comprised of several hundreds of kilometres of tree-less Tundra. Towards the south, however, this vegetation zone transforms into the huge coniferous forest belt of the Taiga. These forests alternate, especially in western Siberia, with extended swamp areas, while the East is dominated by areas with high mountains. At the Pacific coast with the Kamchatka Peninsula, the Sachalin Island and the Aleutian Islands, the landscape is dominated by multiple active volcanoes (see map). (1) The mountain range extends over more than about 1,350 kilometres in the regions of Chabarowski and Primorie (see map). In the north-west and in the north, it borders the Amur and its origin, in the north-east the Strait of Tartary, which separates the Asian mainland from the Russian Sachalin Island.In the east and in the south, the mountain range reaches the Japanese Sea. 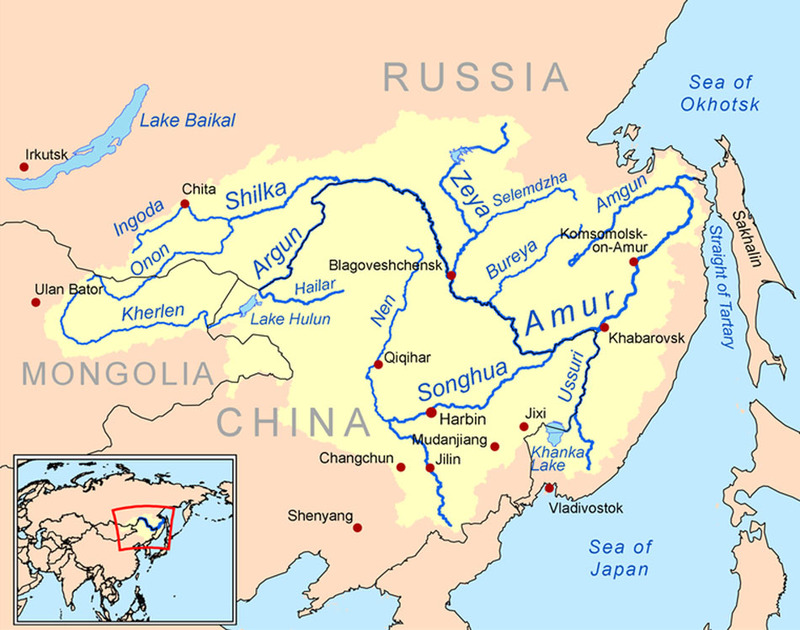 In the west, it borders the valley of the Ussuri having its origin in the south-west of the mountain range, and the river valley of the Amur (see map). In Siberia, there have been existent peoples already for 30,000 years. Settlements dating back to a period before the Ice Age (1) were found in the Altai Mountains. It is believed that this constituted the start of first settlements. Mammoths, bisons and rhinos were living at the ice fringes during the Palaeolithic Age (Old Stone Age). In the course of archaeological excavations, there were found mammoth bones which had been used to build houses. These houses, similar to a jurt, had an oval or semicircular form, and the half thereof was situated underground. When the big mammals became extinct, the way of hunting changed, with the art of fishing increasing; also bows and arrows as well as earthenware were being produced. Already at this time, women played an important role in daily housework routines. Dwellings were composed of one single room having a central fire place and places for sleeping arranged there around. (1) Pre-Ice Age  Sartan Ice Age 12,000 (13,000) until 23,000 (25,000) years ago, this constituted the end of the Pleistocene Period. In all glacial areas, it had become even colder. This period was the coldest part of the Ice Age (Sartan, late Valdai and late Wisconsin). Numerous radiocarbon data of various Siberian areas and of the entire northern hemisphere indicate that it was very cold some 22,000 to 23,000 years ago. Settlements in America are dated back to a period from 13,000 to 14,000 years B.C. Russian researchers try to explain: "We have found proof of a settlement at the Jana River (see map) from a period some 27,000 years or more ago." This is composed of about 800 pieces of bones and bone fragments. Apart from mammoth, bison, horse and rhino, there were also found bones of reindeers. Moreover, there were found further species: musk deer, wolf, Arctic fox, brown bear, and the lion of the Pleistocene Age as well as the wolverine. The Bronze Age was the period of new migration waves of tribes as well as territorial clashes. The settlements became bigger, and they were usually planned in a circular form in order to improve defence features. Dwellings were still situated mostly underground, offering space to an extended family (clan). These dwellings consisted of several rooms, which were arranged in a circular way around the central stable or barn. Turk people immigrated crossing the Altai, where they mixed with the tribes already settling there. With these Turk peoples it was typical that the horse had great significance as permanent companion throughout life as well as after death. As a consequence, there was developed this Siberian indigenous population with the tribes that had immigrated. Wars and clashes among these caused new migrations, and many peoples were driven from the Siberian area. In the 13th century, invading Mongolian tribes exerted high pressure. Following the Mongolian conquest, the realm of the Golden Hord became an important power of the late Middle Ages up to the 14th century, extending from the east of Europe to the west of Siberia (see map). It crumbled, however, due to internal fights and problems. Following its disintegration, there were developed the Khanate Kasan and later on the Khanate Sibir in the 15th/16th centuries. The Khanate Kasan was founded about 1437/38 by Ulug Mehmed in the course of the disintegration of the Golden Horde. Already before that, there had existed an autonomous Volga-Bulgarian principality within the Horde. The Khanate Sibir was a Mongolian Khanate around today's Tobolsk, after which the territory Siberia has been named. It was founded by Khan On, who has already become a legend and who supposedly drove the Khanty and the Mansi people into submission. The Khanate traded furs throughout Asia and was clearly moulded by the cultural heritage of the Golden Horde. Since the 11th century, fur trading had established contact via traders with Volgorod, the then residence of the Russian princes. In the 16th century, the merchant family Strogoroff succeeded in a military conquest of Siberia - with the help of the Don Cossacks who had fled to the Ural area. Under the leadership of Hetman (general) Jermak Timofejew they invaded together in 1581-1585 the river systems following the Ural and drove the Khanate Sibir into submission. In the year 1639 they reach the Northern Pacific and in 1645 the Amur mouth. Until then, there had been taking place endless smaller and bigger battles between tribes and clans, in the course of which sometimes whole tribal groups had been destroyed. For this reason, the distribution of the indigenous population was haltered, and the population growth thereof was slowed, which provided easy access for conquests. But, in this way, also new forms of agricultural farming methods (also cattle breeding), new construction schemes and new hunting styles were brought to Siberia. The first Siberian towns had the character of a fortress, and these were erected at strategically and administratively important sites. They were mainly inhabited by military people, adventurers and the clergy. Otherwise, there were developed village-like structures around a market place or trading centres, initially without churches and administrative institutions. At the end of the 16th / 17th century, about 300,000 people were living in Siberia, wherein the indigenous population had been already driven far up north or south. The cultural characteristics of these peoples were based on the necessity to survive under Arctic and Sub-Arctic conditions in thinly populated areas. They were fishers, hunters or indulged in reindeer breeding. In order to prevent over-utilization of their pastures, they changed their grassing pastures several times a year, as grass is only slowly growing in these short summers. The areas in the Taiga have always been arranged according to customary law in a way so that every clan is assigned to use certain pastures, fishing and hunting territories. Those sites, which are considered holy, this is where the deities of certain waters and forests are residing or where the ancestors are living, are of special importance. 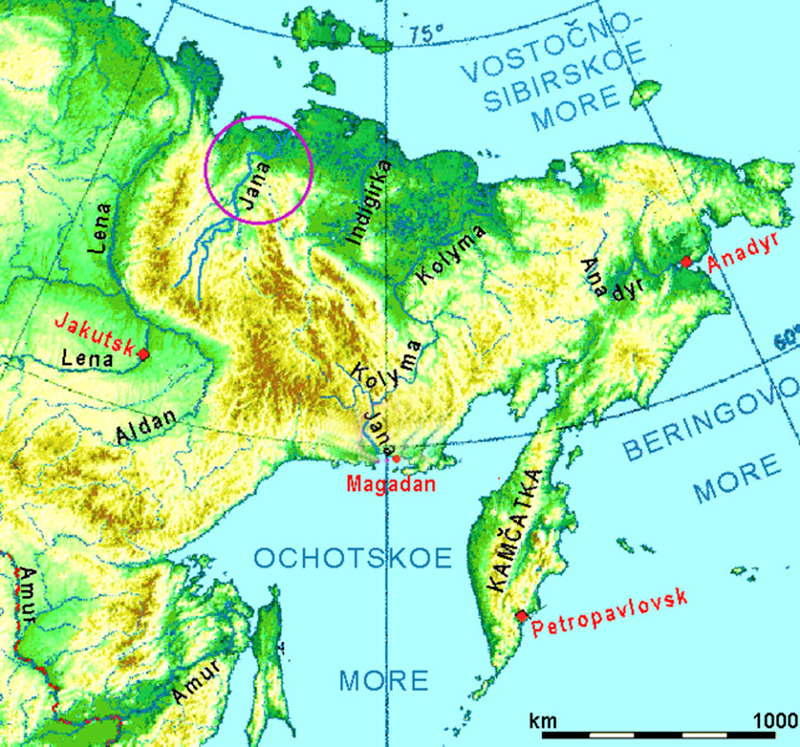 The Khanty, Mansi and the Nenets people were farming western Siberia at the rivers Ob and Irtysh. They traditionally lived on hunting, fishing and reindeer breeding. 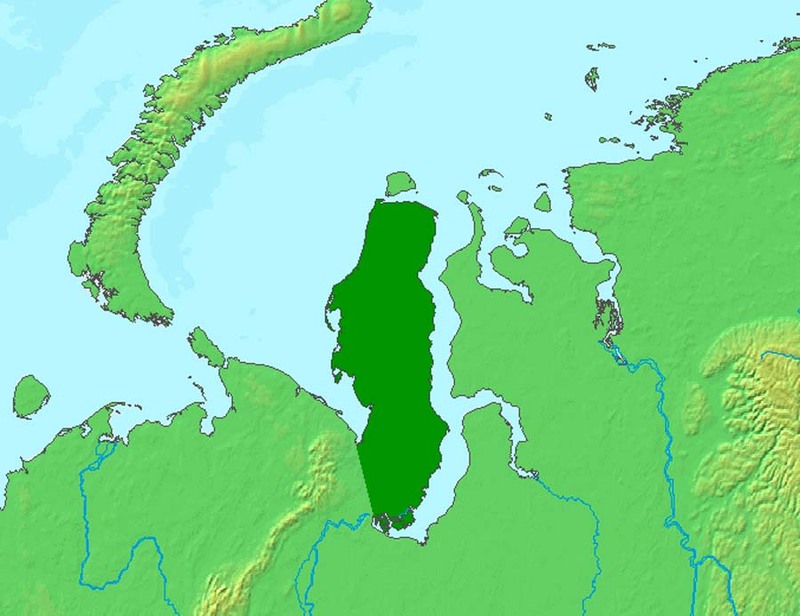 The Nenets people also live on the peninsula Jamal (see map). A majority thereof has been living in nomad tents or in small villages in the Tundra and Taiga. Reindeer breeding constitutes their main economic aspect. New development projects so far have not been really opening up regions that have been industrialized only to a small extent, such as the islands in the utmost north-east. Members of the Nivkh, Nanai, Orok and Evenk people are living on the island Sachalin, and the Itelmen people are inhabiting Kamchatka. The majority thereof are self-sustained fishermen, reindeer herdsmen or gatherers of wild-growing plants. The Nivkh people are traditionally fishermen. The Orok were fishermen and hunters. The Evenks living on Sakhalin nowadays are in part reindeer breeders who have settled down. Domesticated reindeers are used for riding and carrying goods, the wild type is hunted. Once, they were fishermen and hunters who had already established settlements. The majority thereof is nowadays living on the mainland, with only a small group still being inhabiting the island of Sakhalin. 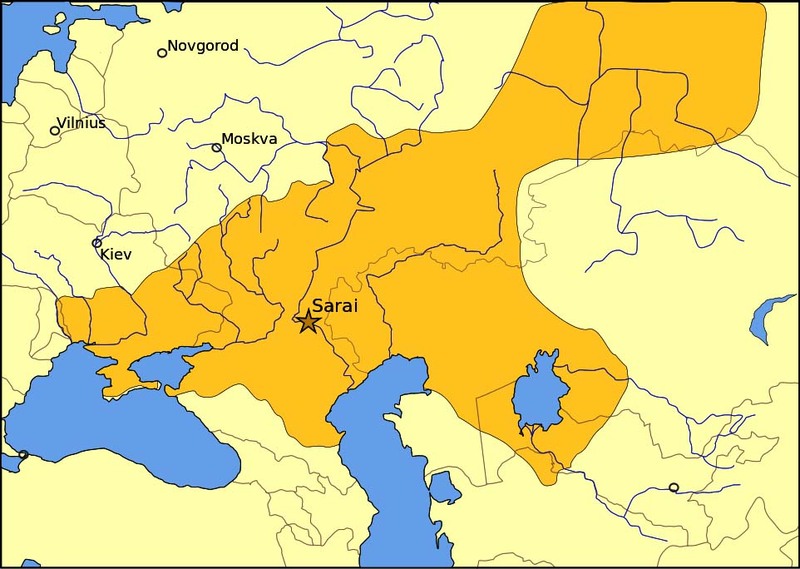 Since the Bronze Age, the south of Siberia has been inhabited and has been characterized by highly developed cultures (in the Minusinsk Basin at the Upper Yenisei or in the Altai Mountains). These were followed by tribal migrations and territorial clashes. The groups leaving these settlements and spreading over the area then developed into peoples of their own. These peoples do not have an ethical uniformity but rather show differences in regard to their origin and their language family. These indigenous peoples were characterized and assimilated by invading groups like the Finno-Ugrian, the Samoyeds and the Manchu-Tungusic people and later on the Turk-Mongolian peoples. These immigrants are designated as Neo-Siberians (usually with Mongolian characteristics), opposing the Paleo-Siberians, which are characterized by compact growth. During a first wave of immigration, especially by Tungusic Envenks and Evens, the Taiga belt became occupied. Later on, these people were pushed far up to the polar circle. In this way, the Mongolian Buryats invading the Baikal region assimilated a part of the Soyons (see also Tuva) and Turk people already settling there. The Paleo-Siberians (Chukhi, Koryaks, Itelmens and others) nowadays constitute the "small peoples". 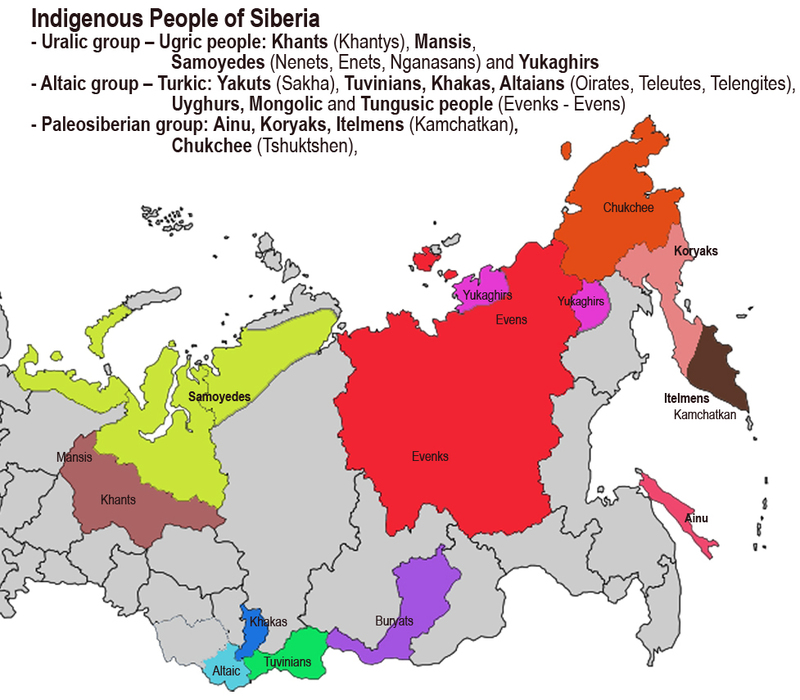 Among the peoples of Siberia there may be distinguished between the "peoples of the north" settling in today's uttermost north of Siberia, and the "peoples of the south" comprising the Buryats, Altaians, Yakuts and Tuvans. Although the individual groups have significantly different origins in terms of history and language, they do share a multiplicity of cultural aspects. The individual life style is influenced by geographical and climatic conditions rather than ethnical descent. Sea fishing, freshwater fishing, hunting and reindeer breeding - in various degrees of importance - constitute traditional ways of living shown by the peoples of the north. Fur farming was included during the colonization by the Russians. Agriculture is a style of living only for those living south of the permafrost line, this is the Karelian, Komi and parts of the Khanty people and the Yakuts. The Yakuts and Evenks living farther south once were cattle and horse breeders. The practical methods of such living forms, the production of traditional tools and handicraft certainly were different between these peoples and between individual regions. New forms such as painting and literature have only come into existence since the Russian conquest. The colonization of Siberia in the 17th century, for the very first time since the introduction of Buddhism by the Mongols and of the Islamic religion by Timur Lenk, offered a basis for missionary work among the Russian-Orthodox population. In Tobolsk, beyond the Ural, the first archbishopric was founded in the year 1620. Under Tsar Alexej Michailovich (1645-1676) the Patriarch Nikon (1605-1681) tried to clear liturgy of contradictions included therein and to return to the rites of the Byzantine Church, which was met by huge resistance on the side of many Old Believers. In the 17th century, those were then persecuted in Tsarist Russia, which is why they settled especially in the fringe areas of the realm or abroad. They moved far into the Siberian area, where they established settlements in seclusion. Buddhism crossed the Mongolian frontier into Russia in the 17th / 18th century, with the Dalai Lama being the spiritual head of Lamaism. Religious reforms in the 18th century under Tsarina Elizabeth were to follow. She made monasteries exempt from taxes and duties, and she excluded the monks from military service. Buddhism was tolerated in Russia until the 1930ies. Under the rule of Stalin, however, all believers were subjected to targeted persecution, with 250 temples and 50 monasteries being destroyed and thousands of monks being killed. Mongolian script was prohibited and replaced, in 1931, by the Latin and, in 1939, by the Cyrillic script. After World War II, two monasteries were re-opened: in 1946 the Ivolginski Monastery near Ulan-Ude and the Aginsk Monastery near Chita. Since 1991 there has been experienced a revival of Buddhism in the Buryat area. Buddhism had reached the Tarim Basin and China by way of several schools and rather soon surpassed Nestorianism and Manichaeism in terms of numbers of followers. Soon, Buddhist rituals were being used. Art, for example, assumed the lotus flower, the symbol of purity, as the basis for the cross. The fundamental values of Christian faith, however, continued to be conserved in the sense of the missions of the East-Syrians. - The main aspect of Nestorianism in teaching emphasizes the disunion between the human and divine natures of Jesus. Each attribute assigned and each action of the incarnated Christ may then be assigned to any of these persons. Both persons are merely united by the band of love. - Manichaeism was a type of revealed religion that was significantly characterized by the teachings of the gnosis, situated in Late Antiquity and the Early Middle Ages. Believers were asked to show asceticism and attempt to strive for purity, which was considered a prerequisite for redemption sought after. Manichaeism has its name from its founder, the Persian Mani (216276/277). The border between the Roman or Byzantine realm and the enemy Persia did not constitute a problem for the distribution of the Christian faith towards the east. Christianity initially moved towards the east predominantly by way of Syrian and Persian merchants. The network of the Silk Road opened up all important regions in Central Asia not only for the exchange of trading goods but rather also for the distribution of religions and cultures. The trading centre Merw had included a Christian community since the fourth century and was rather soon raised to the level of a metropolis, so that there was existent rather early an outpost in the very east. Converted Sogdians helped to spread this new faith as merchants in Merw, western and eastern Turkestan, in Mongolia and in China. The Catholicos patriarch Timotheos I (780-823) was of uttermost importance, as he tried to organize the mission in a systematic way. He provided for the theological and linguistic education of these missionaries. In the 13th and 14th centuries, there were even communities to be found in Manchuria and as far as the coastal regions. Numerous texts (in Turfan, Dun-huang and others) of the Christian type provide information on inter-actions with Christianity in Byzantium and Egypt. The Syrian remained the official church language and was used at least in important parts of liturgy. The rise of the Islam had its end with Ilkhan Ghazan (1295-1304), under whose reign the Mongols in Persia were converted to the Islamic faith. The consequences of the Black Death and the destructive power of Timur († 1405) confirmed the rapid fall of the minority religions in Central Asia at the end of the 14th century. The Nestorians had to return to the mountainous regions of northern Mesopotamia, where they have been struggling to survive ever since. An essential cultural common aspect is the traditional religion, which - before the Russian colonization - had consisted exclusively of forms of Shamanist Animism, the belief in an animated nature, this is the existence of spiritual beings in all natural objects and powers. Human may contact these beings, and these may come into contact with us beings. The spirits of nature may be deliberately contacted by the Shaman, who has gone through a period of consciousness training, in trance (ecstasy), by his soul temporarily leaving the body and entering another level of reality, which is usually not accessible by "normal" human beings. This ecstasy is caused by drumming and monotonous recitals; with drugs being used only in exceptional cases, as far as this is known in general. The Shaman then makes such soul travels in order to negotiate for help or amendment - in the case of illness or other problems - with the spiritual beings of different levels of reality, in the majority of cases for the price of certain sacrifices. These travels may be dangerous for the Shaman, as it has happened not only once that the soul did not return to the body, with the Shaman dying. This attempt, however, was very often successful, and problems were solved or ill persons were rapidly cured. In this connection, this is only logical that also natural medicine and treatment methods using various herbal drugs do play an important role. A central level of reality, in which the Shaman must be well versed, is that of guardian spirits. Those are beings, mostly in the form of animals, among whom the Shaman will select his/her associates, so that these will protect him/her during his dangerous travel and journey into the world of the deceased or even into the world of the creator spirits. These guiding spirits were paid by way of sacrifices. The concept of Shamanist animism of the northern peoples, such as that of the American Indians and other primitive peoples, is that of a well-balanced relationship with nature. All that happens has consequences and effects. This concept, however, is not satisfied by simply relating cause and consequence on the level of the world that may be recognized by common sense. By performing Shamanism, this is a change of undesired conditions by active exertion of influence on events on other levels of reality, these peoples were clearly already ahead of modern ecology. The lack of understanding by the "modern" world, which has been prevailing up to now, is responsible for a great amount of this knowledge already having been lost. Officially, Shamanism with these dangerous soul travels is not performed anymore, although there is still hope that this art has survived unofficially, to which extent, however, has not been known so far. Among a variety of peoples such as, e.g., the Evenks, some Samoyed and Paleo-Siberian groups, however, this natural religion is still alive. The Shamans have also assumed the important position as medicine men and as conservators of important tribal traditions. In the cosmology of the Shamans, there is distinguished between upper world, this world and underworld, which are connected by the World tree in the form of a larch and by the World River. The tree is used by the Shaman on his journey into the upper world or underworld. The souls of the tribe members travel from the upper world, the place of origin, along the river into this world, whereas the land of the dead is situated farther downstream. The peoples of the North are composed of two main groups, the one consisting of the descendants of indigenous peoples having inhabited the country for as long as history tells. It is, however, not known when the first settlers came to the Chukchi Peninsula; it has been assumed, however, because of archaeological findings, that the first settlers had come via the Bering Strait, as this was the case on the American continent. Those settlers who had come to the Chukchi Peninsula, hence, are also related with those in Alaska, not only in terms of the same geographical conditions but rather also in terms of their origin. This fact is further confirmed by a series of features they share with the American indigenous population and some other tribes. Settlement was realized under rather harsh climatic conditions, with the so-called last "Sartan Ice Age (1)“ prevailing in Eastern Siberia. (1) Pre-Ice Age  Sartan Ice Age 12,000 (13,000) until 23,000 (25,000) years ago. Settlements in America are dated back to a period from 13,000 to 14,000 years B.C. Russian researchers try to explain: "We have found proof of a settlement at the Jana River (see map) from a period some 27,000 years or more ago." The majority of the researchers is convinced that migration in Asia was started by a small population group, who had survived the last glacial movements in the Bering Strait, where there had existed a "land bridge". According to their theory, these supposedly date back to common ancestors who had been isolated in Asia after the melting of the glaciers - some 5,000 years ago. DNA studies show that Indians are not descendants of Asian peoples. They are rather an individual group with common ancestors. Due to a genetic marker in the DNA of the modern American indigenous population having no biological function there were found indicators thereof in 41 populations, ranging from Alaska to the southern top of Chile, such as with the Inuit from Greenland, the Chukchi and the Koryaks. These markers, however, are missing in all other Eurasian, African and Oceanic groups. For this reason, the indigenous population of the Americas, Inuit and those settling in the west of the Bering Strait must have the same ancestors, who had been isolated in Asia for more than thousand years before migrating to the New World. Native Americans and peoples of Northern Siberia have the same ancestors! For the last two decades, researchers have participated in discussions, on the basis of genetic data, whether the ancestors of the Indians had come to the New World as “emigrants” in one or several waves or whether these had their origins with a settling Asian indigenous population or a series of different immigrated peoples. Following comprehensive comparisons of DNA samples of modern “Native Americans” and “Eurasian Groups” an internal team of researchers, without any exception, who are in favour of this theory, will realize that an indigenous population should have the same ancestors. Research provides clear indications that in general “Native Americans” will be closer to each other than to any other existing Asian populations, with the exception of those settling at the fringes of the Bering Strait, states Kari Britt Schroeder, lecturer with the „University of California“ and first author of this study. This study was published in the May edition of the journal “Molecular Biology and Evolution”. Earlier studies have already supported the conclusion that data must not be simply brought in line with several indigenous populations. This work is an immediate sequel to earlier studies, which have found a unique variant (an allele) of a genetic marker in the DNA of modern American indigenous people. The synchronization of the “9-Repeat-Allel“ of the variant (which need not have a biological function) was present in all 41 population groups, which were tested from Alaska to the southern tip of Chile, just as with the Inuit from Greenland, and also the Chuckchi people and the Koryaks. 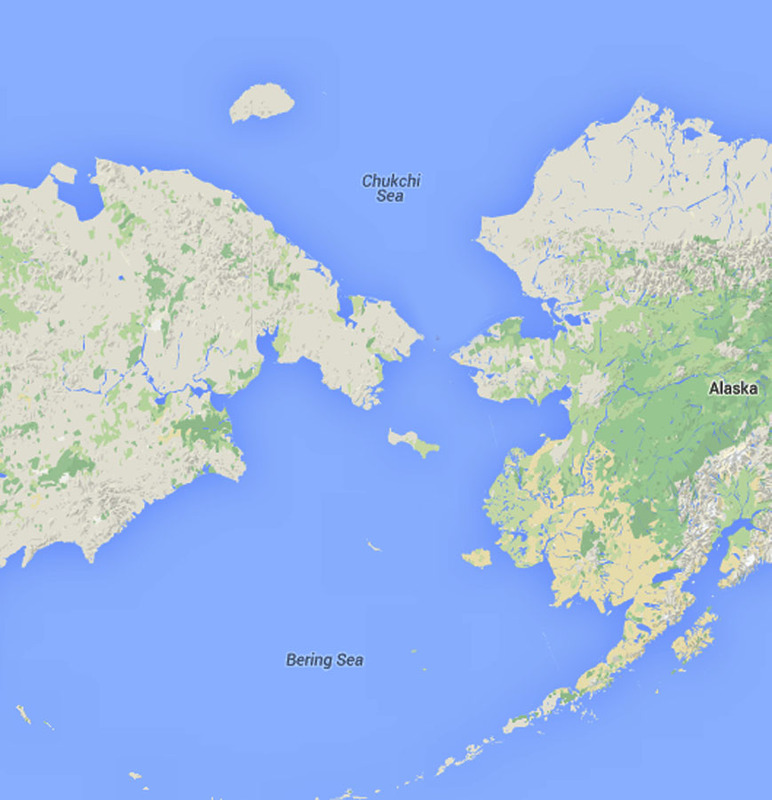 These were all peoples who had originally settled on the Asian (western) side of the Bering Strait. But the allele was not present in all 54 Eurasian, African and Oceanic groups, who had been examined by the team. In these earlier studies, the researches implied that the simplest explanation for this presence of the “9-Repeat-Allel“ would be that all “Native Americans”, Greenland people and those peoples settling in the west of the Bering Strait have their origins in a common indigenous population; and it further implies the fact that an allele in other Asian population groups might have probably led to the indigenous people of America having originated as immigrants from a residual population in Asia  within a period of thousands of years and by way of isolation until they immigrated to the “New World”: this means a period of time sufficiently long in order to maintain the allele and distribute it among the isolated indigenous population. All these peoples have a different origin, and they all belong to different language families. 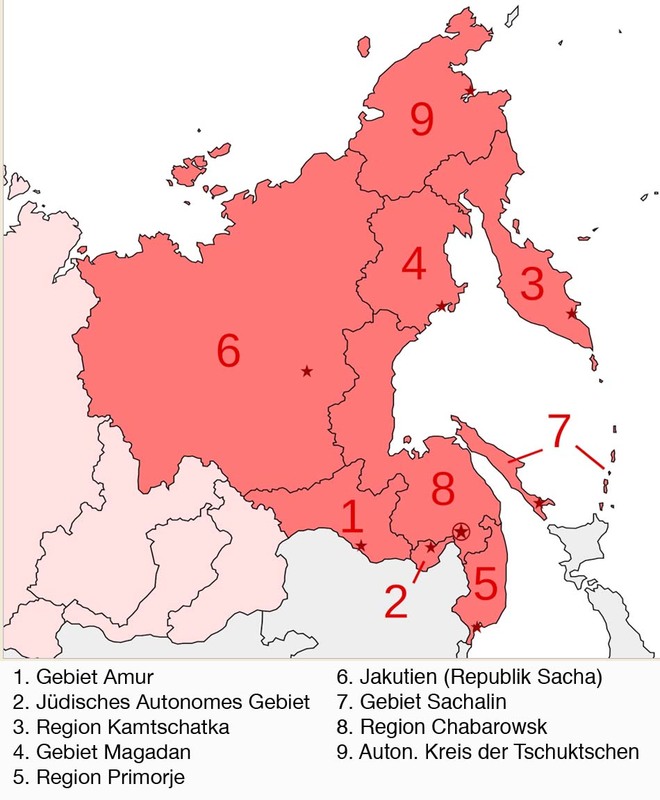 Some rather small groups have survived: the Ket people at the central Yenisei (part of the Finno-Ugrian language family), the Nivkh in the northern part of Sakhalin and at the Amur mouth at the Sea of Okhots (1) speak a Paleo-Sibirian language. Also the Inuit and the Aleuts may be listed among the long-established groups, the languages of which, however, belong to a language family of their own. (1) The Sea of Okhots  lies between Eastern Siberia on the northwest, the Kamchatka Peninsula on the northeast, the Kuril Islands on the southeast, the island of Hokkaido to the south and the island of Sakhalin along the southwest. The neighbouring countries of this sea are Japan and Russia. 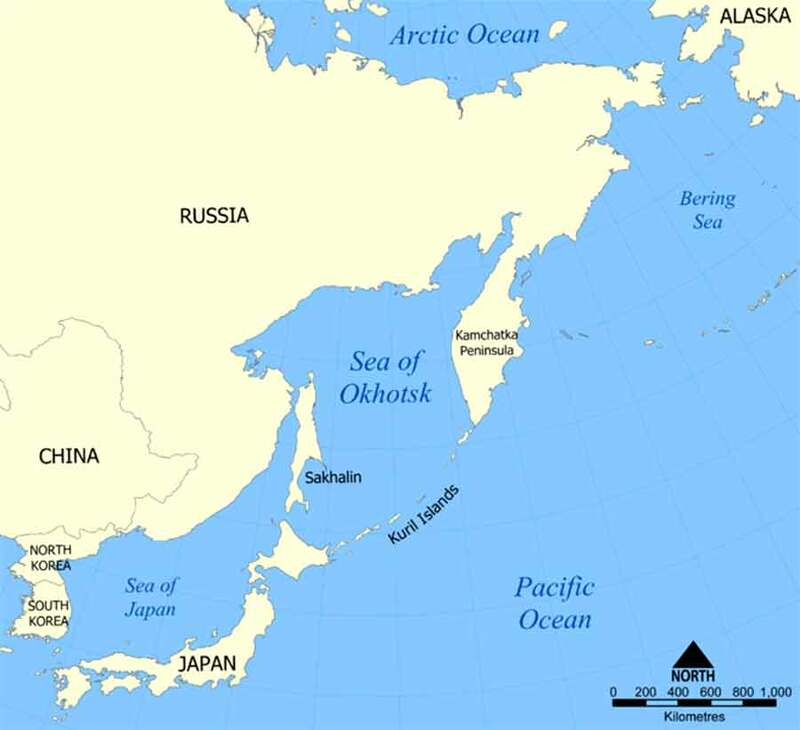 The Tartary Strait in the north and the Strait of La Pérouse in the south of Sakhalin connect the Sea of Okhots with the Japanese Sea (see map). The people of the Ainu has a rather unique position on the southern Sakhalin, the Kuril Islands and the northern island of Hakaido (Ezo) in Japan; they belong to the Europid part, whereas the other peoples of the north are exclusively of Mongolid origin. It is a fact not confirmed so far that the Ainu had formed an indigenous population of the Japanese islands before the Japanese invaded from the Asian mainland. Their language is a rather isolated one. In fact, there are several Japanese indigenous peoples. They were originally hunters and gatherers, with the oldest findings being dated back to about 18,000 B.C. (this is still the Pleistocene Period - which started some 2.588 million years ago); it is, however, still questionable to which extent these findings of the Jomon culture are related with the Ainu. On Russian territory there are not to be found any Ainu anymore. Officially, they were last listed in the population census of 1926, when 32 people claimed affiliation with this people. The other main groups are peoples, the origin of whom lies in Central Asia. They displaced the Paleo-Siberian peoples in the course of their immigration waves before and during the Middle Ages, or they mixed with those and among each other. Their members speak Ural-Altaian languages and thus belong to a language family, which further comprises, among others, Mongolian, the Turk language, Hungarian and Finnish. To the east of the Yenisei, the Altaian language family is prevailing, this is, the Turk peoples like the Yakuts, Dolgans and - further to the south - the Karagasy as well as the Tungusic peoples of the Evenks, the Golden, the Gilyaks, the Nanai people, the Negidales, the Udege people, the Oroquen people, Oroch people and the Ulch people. 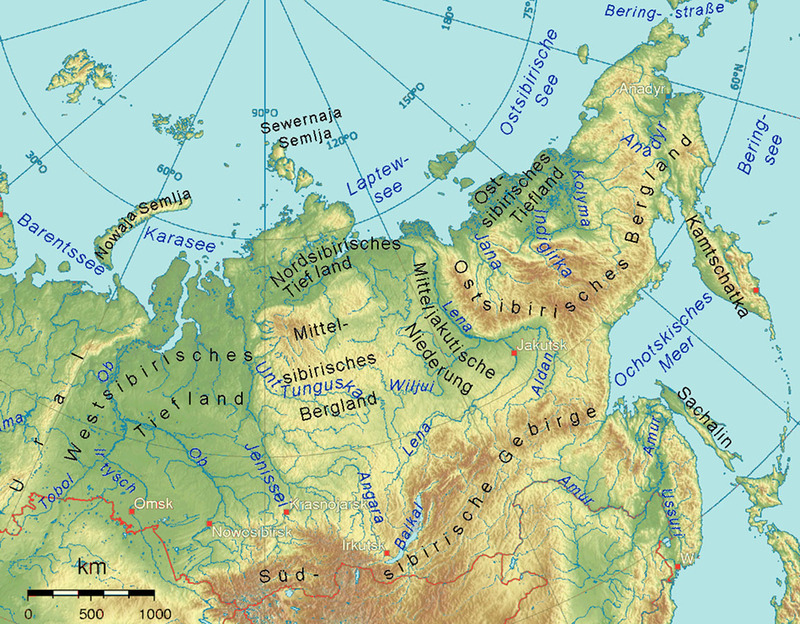 To the west of the Yenisei, as far as the lands of the Sami people, there is the home of the Uralic language group, comprising - from the west to the east - a Finnish group (Sami people, Karelians, Komi people), an Ungric group (Khanty, Mansi people) and a Samoyedic group (Nenets, Selkups, Enets, Nganasans). The majority of these peoples are nowadays only minorities in their old home countries, with the exception of only the Karelians, the Komi people and the Yakuts, who still more or less constitute the population of their home-country and live in autonomous republics sharing a certain level of self-administration within the Russian federation. - more information on: The Proto-Uralian in the Siberian area - see "The peoples of the North"
In the Communist era, there was common comprehensive and partly irreversible intervention in the way of living shown by the indigenous population in Siberia. The aim was to completely abolish nomadism as a way of living. In the 1930ies, collectivization in the form of state-run Kolkhozes was initialized, without taking into account the ownership structures up to then. Clans and families were united in brigades, wherein the people did not work for their own livelihood but rather upon state order. The Socialist aim was from the beginning on ranked above national interests. In a "campaign battling backwardness", there were fought rooted Old Orthodox belief, folk medicine and old traditions in order reach the elimination of all ethical differences. The adoption of Russian surnames and family names was enforced, entailing the loss of one's own individual identity. Increasing consumption of alcoholic beverages showed disastrous effects, with the development of a so-called "Lumpenproletariat", a word literally meaning "miscreant" as well as "rag". Following the ban of the individual languages of the peoples in 1950, pupils were taught in school exclusively in Russian. But also at home the parents were forced to talk Russian with their children. As a consequence, mother-tongues (and, hence, individual languages) were more or less eliminated. From 1960 on, all children had to be obligatorily educated in boarding schools. Even if the children were living in the same city or village, they had to enter boarding schools for ten months. In this way, they spent the longest part of their childhood and teenage years in institutions, in which there were not taken into account national characteristics in any way. The lacking of financial support for cultural activities constitutes an enormous obstacle for a cultural recommencement. The majority of the rural cultural institutions, libraries and schools are in a very bad condition. The traditional folkloristic festivities and artisan creativity became non-existent. The uncontrolled industrialization with the extraction of raw materials in Siberia will be continued. In the north, there are huge resources of wood, coal, oil, gas, metals and other raw materials. The population is robbed of enormous territories. Mines, drilling facilities, roads, plants, deforestation, new industry cities and hydroelectric power plants are blooming, where once there were hunting and grassing pastures. Toxic substances are discharged into nature in an uncontrolled way.